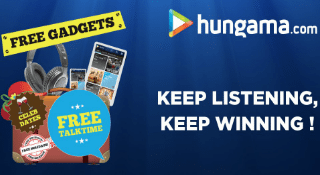 Hungama How to earn coins & Win Free TalkTime, Gifts, Gadgets & more. Hungama, The Ultimate Music App. o Millions of songs & videos from Bollywood, International, Tamil, Telugu, Punjabi and all Indian Regional as well as Devotional Music. o Unlimited Caching. Save as many Songs and Videos for offline play, try it now. o Favorite & share what you like with friends and/ or save them to your playlist. Download the Hungama App & Earn Reward Points. Listen, Like, Share & Win Free TalkTime, Gifts, Gadgets & more. Hungama: Hungama.com Pvt. Ltd. is a company incorporated under the provisions of the Companies Act, 1956 and having its registered office at F-1, First Floor, Laxmi Woollen Mills Estate, Shakti Mills Lane, Off Dr. E. Moses Road, Mahalaxmi, Mumbai-400011 (hereinafter referred to as the “Hungama”, “we”, “us”). User shall mean any individual and a natural person of 18 years of age and above (at the time of registration) who registers with Hungama through the Website or Hungama App by giving correct and complete information. Rewards shall mean products, services, vouchers including e-vouchers, coupons, e-coupons, etc. made available by Hungama and/or facilitated by Reward Partner (defined below) under this Reward Program for the Users. The Rewards shall be updated from time to time. Rewards Program shall mean a program that is developed by Hungama and managed & controlled by Reward Partner that offers its Users various Rewards for redemption upon User’s activity on the Website and/or on Hungama App as per the Action Items stated on the Website, through which the User earns and accumulates virtual coins (“Hungama Coins“). The manner in which the User can earn Hungama Coins and the number of Hungama Coins required to claim Rewards is stated hereinafter. Reward Partner shall mean an independent party that facilitates and provides products & services of various Merchants (defined below) associated with it, to be distributed as Rewards (as listed and updated on the Website from time to time) under the Rewards Program. Merchant shall mean any independent third party that produces/manufactures/offers/sells its products and services and has a tie-up/association with the Reward Partner. IMPORTANT! These Terms and Conditions define and govern the terms and conditions of the Rewards Program and terms of availing the Rewards thereof. This Rewards Program enables the User to earn Hungama Coins based on the activities carried out as categorized under the Action Items listed under the “How to earn” section of the Website. The User can carry out the aforesaid activity through the Website and/or through Hungama App. Nothing in these terms and conditions shall mean to contradict any clauses of the general terms and conditions of this Website. By registering with Hungama either through Website or through Hungama App, the visitor becomes a registered User and upon registration, the User accepts these terms and conditions and further acknowledges and agrees that these terms and conditions are binding upon the User. The User agrees to abide by these terms and conditions of the Rewards Program. To become an eligible User of the Rewards Program, the visitor/user must become a registered account holder by creating an account and completing an online registration form (the “Registration Form”) on the Website or through Hungama App. Once the account is created and validated, the User can earn and accumulate Hungama Coins as per the category of Action Items stated under the “How to earn” tab under Hungama Rewards section of the Website. 2.1 The User will be required to provide the User’s personal information that will include name, username, password, email address, mobile/telephone number, date of birth, gender, address, pincode, city and country and any other information as required by Hungama. 2.2 The User has an option of registering with Hungama through the Website or through Hungama App. The User can access his/her account on both the platforms (i.e on Website and/or Hungama App). Irrespective from where the User has registered himself/ herself the User account / User profile reflects all Hungama Coins that a User earns cumulatively i.e. through his/her activities on the Website or on Hungama App. 2.3 The User is required to provide his/her correct, accurate, truthful, current and complete information during the registration process, as prompted by the Registration Form. The User shall also update such information when needed to ensure that it remains current, accurate, truthful and complete at all times. Any information that the User provides will be verified with testimonials/or other means at the time of disbursement of Reward or for any other purpose at anytime at Hungama’s discretion. 2.4 Hungama shall not be responsible for any loss of data or information or for any loss that may occur to any User in event of failure of the Rewards Program database system or for any other reason whatsoever. 2.6 In event Hungama determines or has reason to believe that the information provided by the User is not current, is inaccurate, incomplete in any way or that the User has provided Hungama with false or misleading registration information, Hungama reserves the right either to suspend or terminate such User’s account or ban/restrict such User’s access to the Website/Hungama App or from any further use of the Rewards Program. 3.1 Hungama Coins can be earned only by performing certain pre-determined activities as per the Action Items stated under “How to Earn” section on the Website. Hungama Coins once earned get credited to the account of the User immediately upon performing such activities (except if performance of such activity is interrupted by any network issue/system error/ session time-out, etc.). The minimum number of Hungama Coins required in order to be eligible to claim redemption shall be 750. The minimum number of Hungama Coins required for redemption is subject to revision made at Hungama’s discretion. 3.2 Hungama has the right at its sole discretion to determine from time to time which activity of the User qualifies the User to earn Hungama Coins and the number of Coins that will get credited upon performing such activities. 3.3 Accrued Hungama Coins have no monetary value and the same cannot be sold, transferred, exchanged for cash or otherwise dealt with except in accordance with these Terms and Conditions. User agrees that once the claim for redemption of Hungama Coins is done and the User is given the Reward that is rightfully claimed by him/her, the Reward so obtained cannot be replaced or exchanged at anytime whatsoever. 3.4 No additional Hungama Coins will be earned through act of redemption of Hungama Coins per se. 3.5 Hungama may, from time to time, at its own discretion, amend and revise the number of Hungama Coins required for redemption of the same for the purpose of claiming Rewards without prior notice to any of its Users. Users will be required to visit the Website/App on a regular and timely basis in order to keep themselves updated with any revisions /amendments made in the criteria to earn Hungama Coins and the terms and conditions herein. 3.6 Should any transaction be null and void, whether immediately or at a later time, then in such a case, Hungama Coins earned with respect to such activity will be deducted from the User’s account without any notification to the User and any such revision in Hungama Coins shall reflect in the User’s account. 3.7 Users can check their available Hungama Coins balance at anytime by logging on to their respective accounts on the Website as well as on Hungama App. Subject to these Terms and Conditions, all the Users shall be able to view updates with respect to Hungama Coins earned by any other User on the Website or on Hungama App. 3.8 The accumulated Hungama Coins balance reflecting in User’s Hungama account shall be deemed to be correct. 3.9 Hungama reserves the right, at its own discretion, within reasonable means and belief, to classify selected activities as null and void, to protect the interest of the Rewards Program. 3.10 The User will have to claim redemption of Hungama Coins within 6 months from the date on which Hungama Coins got credited to the User’s account, failing which Hungama Coins as accrued shall automatically expire without further notice to the User. 3.11 Hungama Coins will not be credited back in the User’s account if the User, for any reason returns, upon receiving the merchandise or does not like any merchandise received as Rewards. 4.1 Redemption of Hungama Coins can only take place upon complete registration of User’s full account information in accordance with Clause 2 subject to successful verification of testimonials of the User at Hungama’s discretion. 4.2 On collection of Hungama Coins, the User may claim redemption of the same as per the Redemption category (i.e. digital goods and non-digital goods category, i.e. merchandise) on the Website and/or Hungama App. It is clarified herein that Users of foreign origin shall be eligible to claim only digital Rewards that shall include download of an audio track, video, movie, streaming packs etc. as per the digital Rewards stated on the Website. Users who are citizens and residents of India can claim both digital Rewards and merchandise Rewards. Merchandise Rewards can be delivered to addresses located in India ONLY. 4.3 Subject to these terms and conditions, Users can claim Rewards by following the process of redemption of Hungama Coins. The User shall make a request for redemption of Hungama Coins to Hungama by writing to [email protected] or call the customer care on +91 92234 04646 or +91 22 6666 4646 between Monday through Saturday (between 9:00 a.m. to 6:00 p.m. IST only) to claim the Rewards. 4.4 Rewards are not transferable, non refundable and non-exchangeable and further Hungama Coins may not be redeemed by anyone else other than the User who is eligible for the same. 4.5 Hungama holds no responsibility if a redeemed product is damaged or defective in any way. Hungama does not give any guarantee/warranty with respect to the products/services offered by Reward Partner/Merchant, as Rewards. The products/services to be given as Rewards will be provided on an ‘as is’ basis. User acknowledges and agrees that the respective Merchant is responsible for its products/services provided as Rewards. Hungama shall not be liable or responsible for any defect or deficiency in the Rewards, at anytime whatsoever. All Rewards are offered to the Users directly by the Reward Partner/Merchant. The User should approach the Reward Partner/Merchant for any matter concerning the Reward so claimed. The User may share his/her feedback on the Rewards so claimed by writing to [email protected] Hungama is not under any obligation whatsoever to either replace with a similar item or to credit to the User’s account in any manner for the number of Coins redeemed. 4.6 Upon the User making a redemption request, as per clause 4.3 above, the relevant number of Hungama Coins will be deducted automatically and immediately from the User’s account. The balance number of Hungama Coins in the User’s account will continue to be valid and may be used to further redeem Rewards, subject to these Terms and Conditions. 4.7 The Rewards claimed through redemption of Hungama Coins is subject to availability of the Rewards so claimed, i.e. the merchandise being provided as Rewards may change without prior notice. 4.8 The User acknowledges and agrees that the availability of Rewards and the requirement criteria of Hungama Coins for redemption purpose are subject to change without prior notice. 4.9 Once the User claims any particular Reward for redemption, the order so placed cannot be cancelled or withdrawn or changed. Rewards once delivered cannot be returned or cancelled by a User. 4.10 Rewards may also comprise of merchandise as listed on the Website (for example: Mobile phones, tablets, ipod, Television set, etc.) All such merchandise Rewards are subject to availability of the same and its use shall be subject to the terms, conditions, specifications of the relevant Merchant/manufacturer of such merchandise/products. 4.11 Rewards may also comprise of travel rewards/ deals / offers and the same shall be subject to availability; and further any travel deal shall be subject to normal airline and weather conditions. The User agrees that all travel rewards/ deals /offers are subject to the terms and conditions of the respective Merchant/service provider, travel agent and airlines. 4.12 Users shall be responsible and liable for any and all costs, charges, taxes, liabilities or claims of any nature whatsoever arising from the provision or availability of Rewards, facilities, benefits provided or made available to the User by Reward Partner/Merchant by virtue of User’s participation in the Reward Program. 4.13 Rewards offered for Redemption is and will be at the discretion of Hungama /Hungama Reward Partner/Merchant and any of the terms are subject to change without prior notice. 4.14 Hungama and Hungama reward Partner will not be responsible for changes to, or discontinuance of, any of Merchant’s product or service. Hungama shall not be responsible if the Reward Partner withdraws any Merchant from its network from providing any product and service or if the Merchant itself becomes non functional. 4.15 Hungama is not liable for any damage caused to any User/person in relation to redemption of Rewards by the Users under the Rewards Program. 4.16 The images of products and services being offered as Hungama Rewards and displayed under the Redemption section of the Website are merely indicative and subject to change as per availability and the same will be updated from time to time. 4.17 User agrees and acknowledges that all warranties, guarantees and undertakings with respect to the products and services offered as Hungama Rewards is the responsibility of the Reward Partner and the respective Merchant providing the same and that Hungama shall not be liable or responsible for any fault, defect or deficiency in the Rewards being provided. 4.18 The User will contact the Reward Partner /respective Merchant/ service provider in case of any defect or deficiency in the Rewards. Hungama will not be liable or responsible for the products and services offered as Rewards for redemption purpose and further Hungama gives no warranty with respect to quality of products or services being offered as Rewards or their suitability thereof for any purpose. 4.19 The User acknowledges and agrees that all Hungama Rewards of any nature shall have a validity period associated with it post which these Rewards will not be honoured by the respective Merchant and Hungama shall not be responsible for any such lapse of time that has occurred due to the User’s inability of availing any of the Rewards within the stipulated validity period. 4.20 The User acknowledges and agrees that Hungama is merely facilitating a Rewards Program for its Users and that the products and services being offered as Rewards are provided by the Merchant directly to the User upon complete compliance of the terms and redemption procedure by the User, and accordingly all the Rewards against which redemption has been claimed by the User will be honored by the respective Merchant and Hungama shall not be responsible in event of failure to provide the Reward by any such Merchant to the User. 4.21 Availability of Rewards and Hungama Coins required for redemption are subject to change without prior notice. 4.22 Hungama has no liability for the acts and omissions of the Reward Partner and/or Merchant. 4.23 Users expressly waive any rights or claims of liability against the Rewards Program, Hungama and/or any of its employees or agents for any products or services provided under the Rewards Program. 4.24 Hungama reserves the right to refuse the claims of redemption, or recall the same, if Hungama should have any reason to suspect that Hungama Coins were fraudulently accumulated by the Users or wrongfully earned/recorded. 5.1 The Rewards Program will continue till the time Hungama will run the Rewards Program. Hungama has the sole authority to dissolve the Rewards Program at anytime. Entitlements to the Rewards Program’s existing Users will cease to be available on and from that particular date forward. Hungama is not liable to inform the users about dissolution or closure of the Rewards Program in the event such situation arises. ermination, all accumulated and remaining Hungama Coins shall become void and irredeemable. – If Hungama suspects that Hungama Coins were fraudulently accumulated by the User. 6.1 The Website www.hungama.com and Hungama App is the property of Hungama and is managed and controlled by Hungama at all times. 6.2 By submitting any materials or contents, which shall include the User’s name and personal details, and which are available for access by the general public through use of the Website and/or Hungama App, the User hereby grants to Hungama and its affiliates, a royalty free, perpetual, right and license to use, license, reproduce, modify, create derivative works from, distribute, derive revenue or remuneration from, communicate to the public, perform and display content (in whole or in part) worldwide and/or to incorporate it in other works in any form, media or technology now known or later developed, for the full term of any rights that may exist in such contents. 6.3 In connection therewith, the User warrants and represents that the User owns or otherwise controls all of the rights to the content in question, including, without limitation, all the rights necessary for the User to post the content on the Website and /or through Hungama App. – Understand and analyse Users’ needs and preferences. 7.3 Hungama does not give, rent or sell Users’ lists from the Rewards Program to any organization or individual other than to Hungama’s respective holding companies, subsidiaries, associates, partners, or related corporations to use, process, disclose, transfer or to deal with the User’s database in whatever manner and for whatever purposes as shall deem fit without prior notice or for the purposes of disclosure under the law or any court order or other governmental or regulatory bodies requirement. By using the Rewards Program, the User agrees to the extent permitted by law, to indemnify and hold Hungama, its directors, officers, employees, affiliates, agents, partners, representatives, contractors, and licensors/licensees harmless with respect to any claims arising out of User’s breach of any of these terms and conditions, the User’s use of the Website, Hungama App and further the User shall also indemnify against any action taken by Hungama as a part of its investigation of a suspected violation of these terms and conditions. This means that the User cannot sue or recover any damages from Hungama or any of its directors, officers, employees, affiliates, agents, contractors, partners, representatives, and licensors/licensees as a result of its decision to remove or refuse to process any claim, to warn the User, to suspend or terminate the User’s access to the Website or Rewards Program or to take any other action during the investigation of a suspected violation or as a result of Hungama’s conclusion that a violation of these terms and conditions has occurred. This waiver and indemnity provision applies to all violations described in or contemplated herein. 9.1 The User hereby acknowledges and agrees that Hungama assumes no contractual or legal responsibility to the User. The accumulation of Hungama Coins does not entitle the User to any vested rights and, in accumulating Hungama Coins, Users may not rely upon the continued availability of any Reward, premium, privilege or any other benefit. Hungama specifically reserves the right to amend, alter, withdraw or terminate the Reward Program (in whole or in part) including the right to amend, alter, withdraw or terminate any benefit being given as a Reward hereunder. Hungama reserves the right at its sole discretion to reduce or nullify Hungama Coins of the User if found that the User has earned through illegitimate and wrongful means. Any such changes may affect Hungama Coins which a User has already accumulated as well as any future accumulation of Hungama Coins. Hungama reserves the right at all times to amend, alter, modify, revise these terms and conditions. The User’s continued access to and usage of the Website and /or Hungama App shall be deemed to be the User’s acceptance of any revised/amended terms and conditions. 9.2 The User agrees that he/she shall not copy, reproduce, redistribute, sell, publish, display, perform, modify, transmit, license, create derivatives from, transfer, misuse, tamper or in any way exploit any part of any information, content, materials, services available from or through the Website and/or App. 9.3 The User agrees that he/she will not use the Website and/or App for any purpose that is unlawful, or prohibited by these terms and conditions. The User also agrees that he/she will not use the Website and/or App in any manner that could damage, disable or impair the Website/App or interfere with any other party’s use or enjoyment of the Website/App. 9.4 The User acknowledges, understands and agrees that Hungama is not responsible for the content/materials or other services on third party sites linked from Hungama Website/App. The User agrees that the User’s access of hyperlinks to other internet sites are at the User’s own risk and the content, information, expressed, and other links provided by these sites are not monitored, verified /endorsed by Hungama in any way. Hungama does not make any warranties, and expressly disclaims all warranties express or implied, including without limitation, those of merchantability and fitness for a particular purpose, non-infringement with respect to any information or services or products that are available or advertised or sold through these third party websites. 9.5 Hungama shall not be liable if any Rewards claimed is not redeemed or any Reward redemption is not completed if performance of obligation by Hungama and/or Reward Partner is prevented, hindered or delayed by a Force Majeure event (defined below) and in such case its obligations shall be suspended for so long as the Force Majeure event continues. “Force Majeure Event” means any event due to any cause beyond the reasonable control of Hungama/ Reward Partner including without limitation, unavailability of any communication systems, any natural calamity including fire, flood, explosion, acts of god; civil commotion, strikes or industrial action of any kind, riots, insurrection, war, acts of government, computer hacking, unauthorized access to computer data and storage devices, computer crashes, malfunctioning in the systems getting affected by any malicious, destructive or corrupting code or program, mechanical or technical errors/failures or power shut down, faults or failures in telecommunication etc. nate the Rewards Program or replace it with another program at any time and the same may be notified at Hungama’s sole discretion. 9.7 These Terms and Conditions shall govern the account established in the name of the User including Hungama Coins’ redemption by the User. 9.8 User participation in the Reward Program and all related benefits are offered at the sole discretion of Hungama. Hungama reserves the right to amend these Terms and Conditions, the services, Rewards Program, Rewards to be earned through Hungama Coins’ redemption at any time without prior notice to the Users. 9.9 Every effort is made to ensure that information supplied to the Users is correct. However, Hungama will not be held liable for any inaccuracy or erroneous description or information on the Rewards Program and these Terms and Conditions. 9.10 All communications and/or correspondences done by Hungama, either via e-mail, SMS, mail, advertisements and/or any other media deemed fit shall immediately supersede the previous communication and/or correspondence with regards to the same matter, unless expressed and clearly stated otherwise. 9.11 Any notice, communication, summary or other materials if required to be given pursuant to these Terms and Conditions shall be sufficiently sent to users by email (to email addresses according to Hungama’s records) and shall be deemed to have been delivered immediately and/or publication on the Website. 9.12 Hungama is the final authority as to the interpretation of these Terms and Conditions and as to any other questions or disputes regarding the Rewards Program. 9.13 Hungama assumes no responsibility for any loss of any nature resulting from Users’ participation in the Rewards Program. 9.14 Hungama assumes no responsibility for any technical failure of the Rewards Program system, e-mail system and mobile short-messaging-service system. 9.15 Hungama assumes no responsibility for any system malfunction and/or permanent loss of the database system including but not limited to Hungama Coins database Hungama data stores due to any malicious activities or due to any Force Majeure event. As such, Hungama will not be held liable for any form of compensation regarding the above. 9.16.2 Hungama reserves the right to vary the terms of the Fair Use Policy from time to time. 1. It is unreasonable use of Hungama Website and/or Hungama App and/or Hungama services where the User’s use is reasonably considered by Hungama to be fraudulent or if it adversely affects Hungama or other Hungama customers’ use of or access to Hungama services. 2. It is unreasonable where the User’s participation in a promotional activity is reasonably considered by Hungama to be fraudulent or if it adversely affects Hungama or another Hungama customer’s use of or access to Hungama services. c) posting of junk, irrelevant, blank or repetitive comments, etc. e) saving one and the same playlist/ discovery multiple number of times, etc. 9.16.5.1. Where the User is in breach of this Fair Use policy, Hungama may at its discretion contact such User to discuss his/her usage so that it conforms to this Fair Use policy. b) terminate the User’s account at Hungama’s sole discretion. 9.18 Employees of Hungama, Hungama affiliates and Reward Partner shall not be able to redeem their Hungama Coins as earned under this Rewards Program. 9.19 These Rewards Program terms and conditions are governed by and shall be construed in accordance with the laws of India. Users hereby expressly submit to the exclusive jurisdiction of the Courts of Mumbai, India. 9.20 These Terms and Conditions are available to the Users in English only. Hi there to all, it’s actually a fastidious for me to pay a visit this web site, it contains priceless Information.